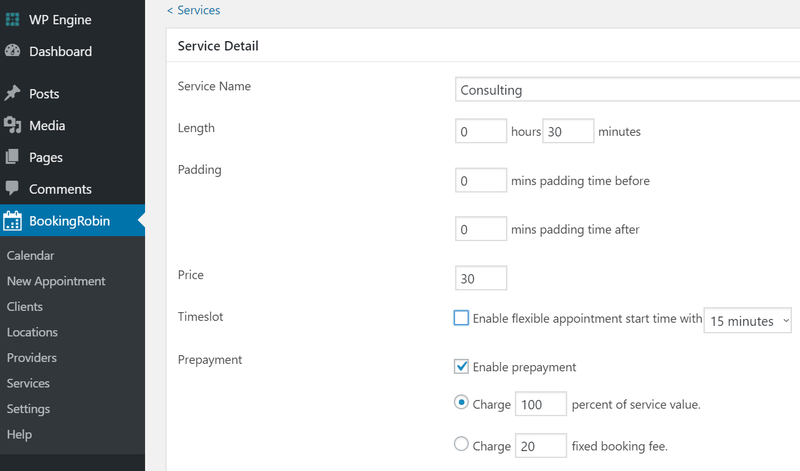 To charge clients at the time of booking, you need enable prepayment in service detail page. Under WP Admin > BookingRobin > Appointments > Services > Service detail page > Service Detail section, enable Prepayment. Define how much you want to charge clients at the time of booking. Once prepayment is enabled, appointments will not be added to the calendar unless payment is processed successfully when clients make appointments. Under WP Admin > BookingRobin > Appointments > Settings > Payments page, you may customize the payment confirmation message.